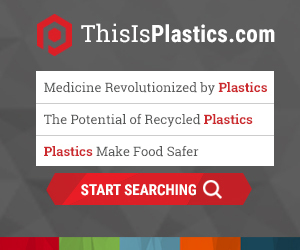 The plastics industry is positioned to play a significant role in the healthcare and medical device space as the demand for services and single-use products grows in conjunction with the graying population, a study released by SPI: The Plastics Industry Trade Association said. 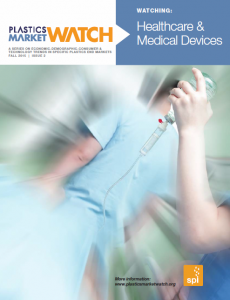 In its report, “Plastics Market Watch: Healthcare & Medical Devices,” SPI discusses advances in plastics that have enabled the material to gradually displace traditional medical devices made of metal, ceramics and other substances. Due to plastics’ extraordinary versatility and the constant development of new blends, it seems extremely unlikely that plastics will be replaced by another material, at least not in the foreseeable future. The change now underway is exciting and foretells longer and healthier lives for humanity – and new applications for plastics. Using this as a backdrop, the report draws on the work of Ken Gronbach, a multi-generational marketing expert and author of “The Age Curve: How to Profit from the Coming Demographic Storm,” to explain the future market and the population that’s driving it. Gronbach said the world’s population is setting up healthcare’s perfect storm. “There will be a collision of the largest generations ever to become elderly with the age sector that demands the most healthcare services. In many cases, worldwide the number of 70-plus year old people will double. When a market doubles in demographic size, the demand for products and services related to that market more than doubles – a phenomenon called ‘the multiplier effect,’” he said. All of the critical data – soaring populations, rising middle classes, aging population, advances in medical technologies – point to an ever stronger market for medical devices which today are largely comprised of plastics. In earlier years, the growth of plastics in healthcare, particularly medical devices, came largely from material substitution, but that transition has been accomplished. Now the growth of the medical device market is almost synonymous with rising demand for plastics, or so it would seem. The shift to non-invasive medical protocols in particular will reduce the demand for many plastic basics of medical care. For equipment manufacturers, the changing face of modern medicine means smaller equipment, but that will not directly impinge on plastics. Resin suppliers will not see much change because not a huge amount of resin goes into medical equipment. The market for plastics in medical devices is stable and growing, but producers must monitor the market carefully, anticipate changes coming down the road and be prepared to meet them. They must also keep tabs on the regulatory landscape for one can never be sure which way the political fortunes will blow in response to inflammatory news stories or consumer complaints. Major shifts in the provision and funding of healthcare in this country will drive increased focus on reducing costs at all levels of the medical care industry, and a series of breakthroughs in medical science promise a variety of less physically intrusive medical therapies that will reduce the need for disposable medical devices, which are largely composed of plastics. In the distant future, these forces will to some extent counter the generally positive trajectory for use of plastics in medical devices. But for the foreseeable future, the role of plastics in modern medicine is dominant and likely to remain so. SPI plans to conduct presentations and webinars in conjunction with this report to discuss our findings, and hope that these will provide important food for thought, whether you are an equipment manufacturer, materials supplier, processor, recycler or brand owner. Future reports issued later this year will focus on Plastics in Packaging, and Plastics in Building & Construction. “Plastics Market Watch: Automotive & Transportation” may be accessed by clicking here.